Dehydration in children and babies is something we must fear and guard against at all times because it can be dangerous and life threatening. 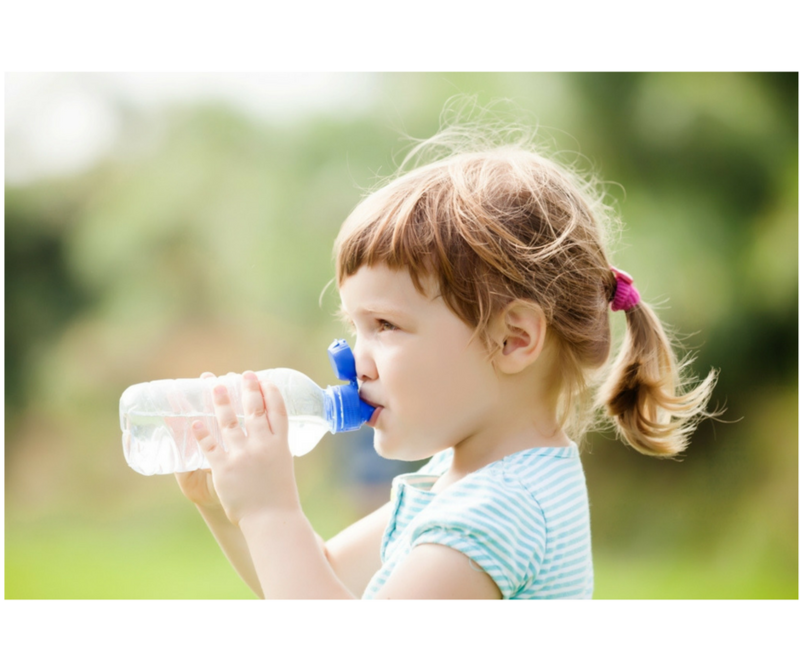 In this article find out why children get dehydrated so easily, how to identify dehydration in children and how to treat and prevent dehydration in children. When the body loses too much water – the body goes into a water deficiency state called dehydration. 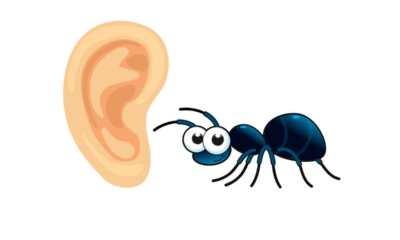 Losing a small amount of fluid from the body is normal and happens every day and all the time. This water loss from the body is easily compensated by water that enters the body through food and water. When the water loss from the body increases beyond a certain critical amount, it results in dehydration. The normal amount of water that it is OK for the body to lose, varies from person to person. It also changes at different ages and in different seasons or under different climatic conditions. When can a child get dehydrated? When the child has loose motions. 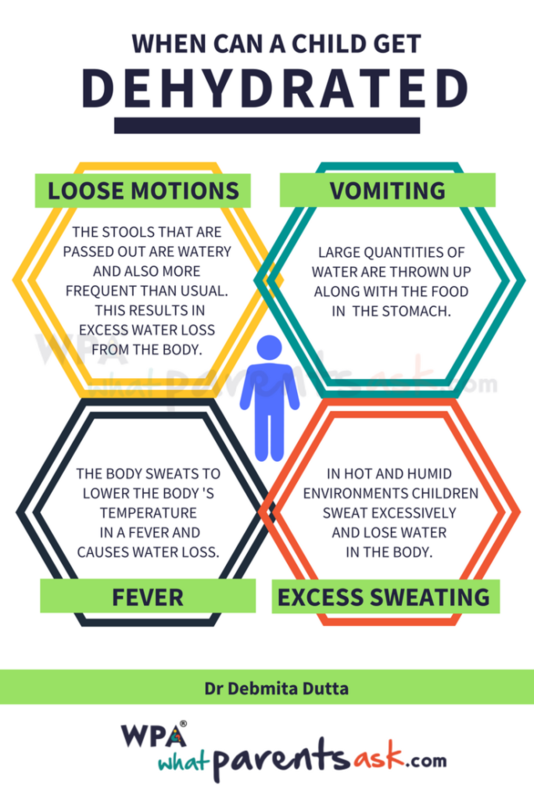 When a child has loose motions – the stools that are passed out are watery and also more frequent than usual. And this results in excess water loss from the body. When the child has vomiting. When a child has vomiting – large quantities of water are thrown up along with the food and other contents of the stomach. And this can cause dehydration. When a child has fever. 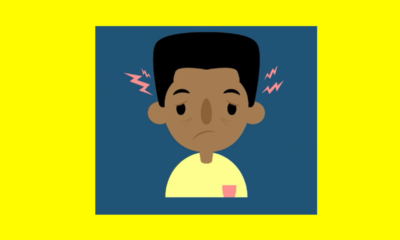 When a child has fever – the body temperature is elevated. Elevated body temperature is unacceptable to the brain and the body sweats to lower the body temperature. This sweat may not be visible – but it results in the loss of body water and dehydration. When a child sweats excessively. It certain hot and humid environments children sweat excessively – especially if they are physically active. And this excessive sweating can result in dehydration. Children begin to refuse to eat and drink as soon as they fall sick – increasing the chances of going into dehydration more rapidly. Children are dependent on their caregivers for food and water and may not eat and drink unless reminded. If you find that your baby is asking for frequent breastfeed, has dark-colored urine or is urinating less frequently than usual – your baby may be going into dehydration. The treatment of dehydration involves the replacement of fluids such that body fluids that have been lost are restored to their normal levels. Kids who are mildly dehydrated will be very thirsty and will constantly ask for water. Give the child as much water as he /she wants. Drinking plain water is the best way to replenish fluids. Juices or fizzy drinks are not useful because they dehydrate the body further. The child must be made to rest in a cool shady place until all the lost fluid has been replaced and he/she is no longer dehydrated. It is best to take off any extra clothes and lie down with the feet elevated until all signs of dehydration have disappeared. 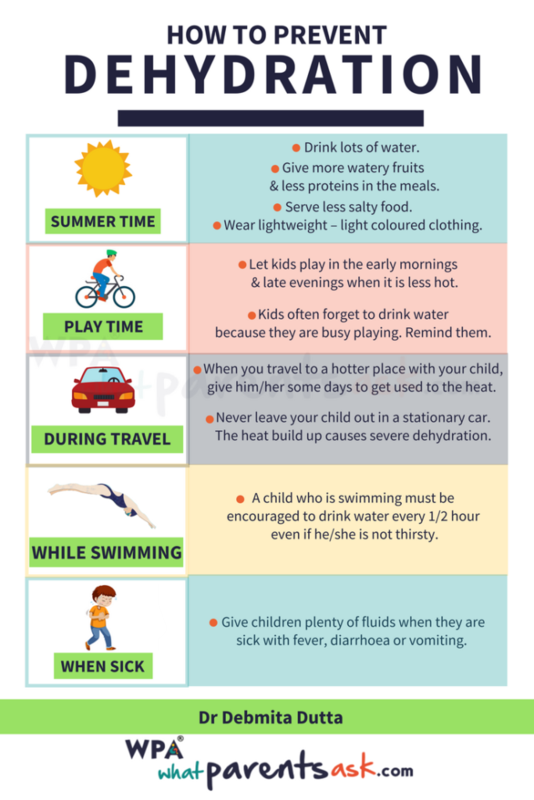 It is important to remember that the child will take up to 24 hours to completely recover from dehydration and must not go back to playing in the sun as soon as he/she feels better. 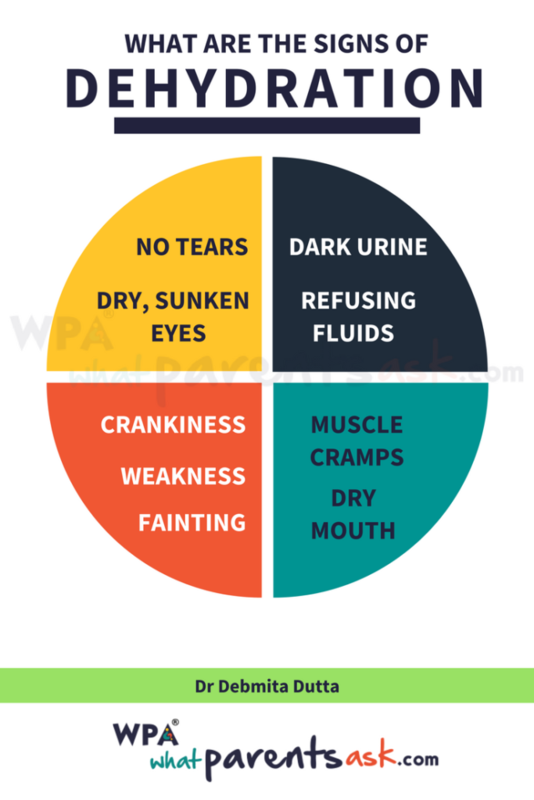 This degree of dehydration is usually caused by diarrhea or vomiting where a lot of fluid is suddenly lost. The child is usually not thirsty in this case because he/she has not been out in the heat or done any physical activity. This type of dehydration is treated by giving the child ORS (Oral Rehydration Solution) which is easily available in most chemist shops. ORS is the mixture of a certain definite quantity of sugar and salt in water. It is best to give the child this solution in spoonfuls – instead of asking the child to drink from a glass as this may cause vomiting. 1 -2 teaspoons of ORS can be given every few minutes. It is best to have the child lying down in a propped up position while re-hydrating the child. Severe dehydration can only be treated in a hospital by trained medical personnel. It is important to move a child with moderate dehydration to the hospital if he/she does not improve within 15-20 minutes of starting ORS. Or if the vomiting and diarrhea continue to the extent that the child appears to be losing more water than can be given by the spoon. Dehydration is an emergency and can be life threatening if immediate action is not taken. It is important to stay very alert around children who may be dehydrated for any reason. When to take the child to the hospital in dehydration? 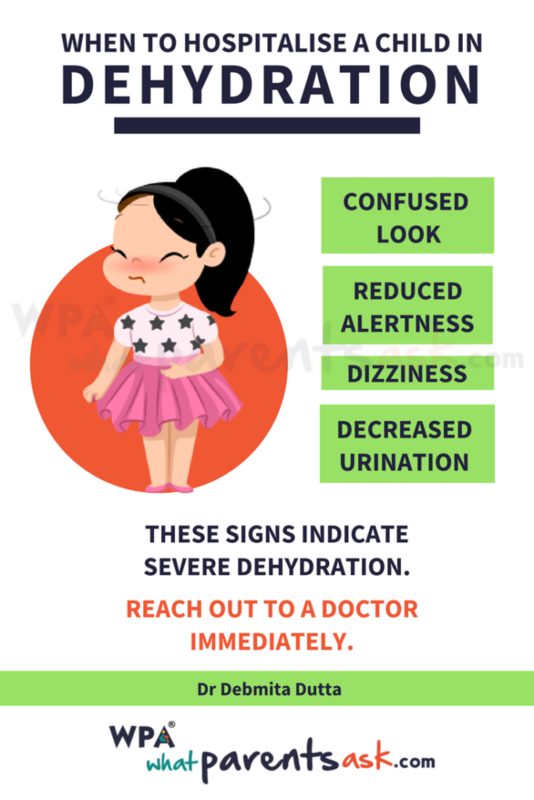 A child who looks confused and shows reduced alertness needs immediate attention from a doctor as he/she is likely to be severely dehydrated. Dizziness and fainting also requires the attention of a doctor. 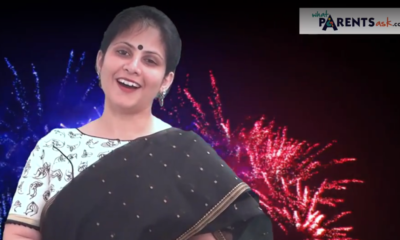 Decreased urination is also reason to reach out to a doctor for treatment. Dehydration can be prevented by ensuring that children get plenty of fluids when they are sick with fever, diarrhea or vomiting. Or if they have been playing in the hot sun. Sports activities must be conducted in the early morning or late in the evening and not during the hottest hours of the day. Children must drink water even before they get thirsty. By the time a child starts feeling thirsty – he/she is already dehydrated. 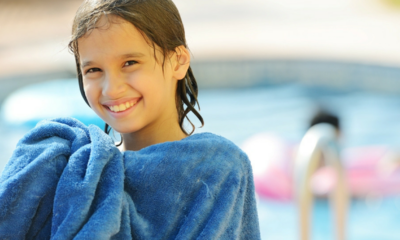 When children are swimming they may not feel thirsty at all but can go into dehydration. A child who is swimming must be encouraged to drink water every half an hour even if he/she is not thirsty. Dehydration can happen even when it is not hot and without the child sweating or feeling thirsty. This can happen when children just forget to drink water because they are busy playing. It is important for children to be reminded about taking breaks and drinking water even if it is not hot and they are not thirsty. 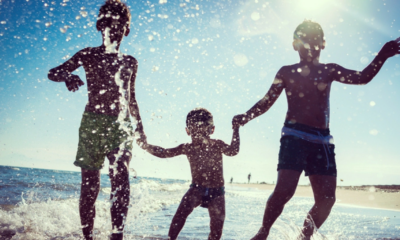 When you travel to a hotter place with your child – give your child a day or two to get used to the higher temperature before you take your child out in the sun. Never leave your child out in a stationary car for even a few minutes with the windows up. The heat build up in the car can cause severe dehydration very rapidly. Clothe children in lightweight – light coloured clothing during the summer months. Give children more watery fruits to eat and fewer proteins in their meals. Reduce the amount of salt that you serve in meals. Salty foods cause more dehydration. Children get dehydrated easily and dehydration can be life threatening. Always stay alert for signs of dehydration if you have children under your care.